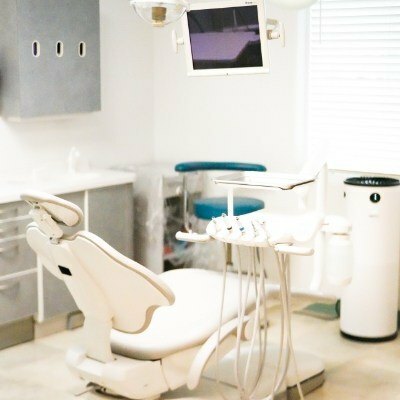 At Estrada Dentistry, we’re proud to say that we truly have a state-of-the-art practice filled with some of the latest and greatest dental technology available today. With the newest tools, we’re able to provide an even broader scope of care in less time while keeping our patients more comfortable. Sounds pretty nice, right? They allow us to do everything from diagnostics to treatments to patient education at a much higher level, all of which will lead to you enjoying a happier and healthier life filled with more beautiful smiles. Do you struggle with snoring, daytime drowsiness, or memory loss? Do you have trouble concentrating or routinely feel sleepy behind the wheel? These are all signs that you may be struggling with a sleep disorder known as sleep apnea. At Estrada Dentistry, we’re happy to offer care for this common but underdiagnosed condition. Many patients have experienced relief from their symptoms with a customized oral appliance. To learn more about sleep apnea and how we can help you treat it, visit our sleep apnea page. Does going to the dentist make you feel a bit nervous? If so, there’s no shame in that, as tens of millions of Americans feel the exact same way. 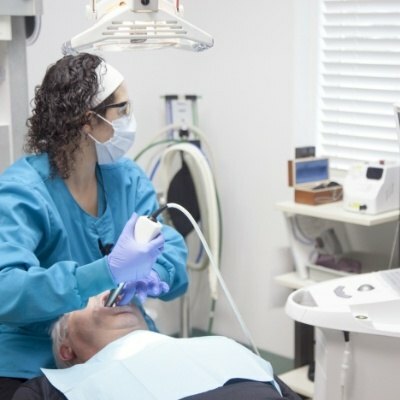 At Estrada Dentistry, our warm and friendly team does its best to allay any fears a patient might have, but for those who need a little extra help to feel comfortable in the dental chair, we’re happy to provide sedation dentistry. With nitrous oxide, all a patient has to do is breathe in an odorless gas through a small nasal mask during their procedure to enjoy a light, happy, and even euphoric feeling during their appointment. Or, for people with a more severe dental phobia, we can offer oral conscious sedation, in which you simply take a pill before your appointment. 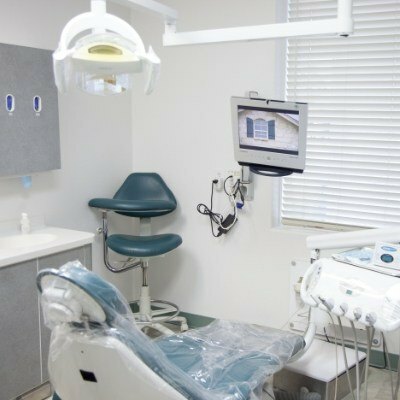 In addition to helping your appointments remain calm and cool, sedation can also allow a patient to receive multiple procedures in fewer appointments in order to save time. Wouldn’t it be great if you could actually see what your dentist was talking about? Much of our job at Estrada Dentistry is simply trying to explain things patients can’t actually see, and it would be so much easier if we could just SHOW them what we were looking at. With the Sopro Life intraoral camera, we now have that capability. This small, camera-tipped wand is no bigger than a pen, and it can be easily maneuvered within the mouth to capture high-resolution images of the teeth and gums we can instantly display on a large chairside monitor. These images make it much easier for our team to catch small dental issues and explain why we might be recommending a certain treatment. You’ll finally be able to see your smile from your dentist’s point of view, gaining a much deeper understanding of your dental health in the process. X-rays have long been an essential diagnostic tool in dentistry, and to make it even better, we have invested in the most advanced version of them. 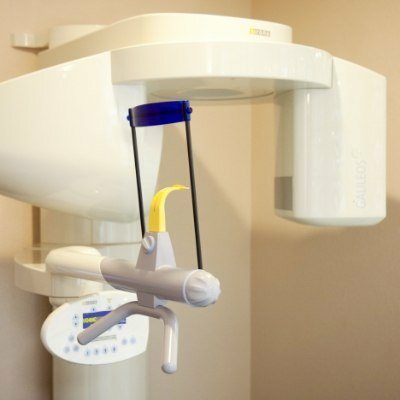 With digital X-rays, we’re able to capture crystal-clear images of the surfaces below your teeth in gums in seconds without needing to develop them using harsh darkroom chemicals like in the past. These images can then be displayed on a chairside monitor for your dentist to go over them with you. They can point out what they are seeing so you can know exactly what is going on with your smile. And better yet, these X-rays also expose our patients (and us!) to 90% less radiation compared to traditional ones. Plus, because everything is entirely digital, the images can be instantly stored, sent, and augmented to make them easier to understand. They especially make getting insurance approval for certain procedures a breeze! Sometimes, we need a little bit more information than what a regular X-ray can tell us. In these situations, we like to use out Galileos 3D cone beam scanner. It’s able to create a fully three-dimensional X-ray image of your teeth, jaw, and other surrounding structures, including soft tissues. 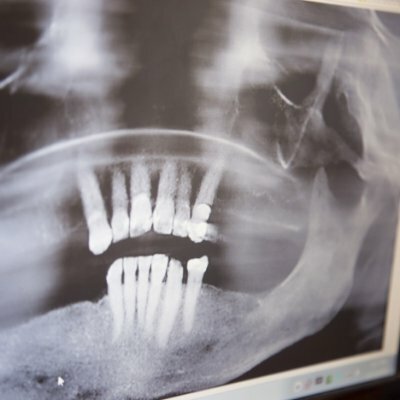 It isn’t as detailed as a regular X-ray, but it allows us to see different things such as the locations of nerves, infections, or un-erupted teeth. In addition to giving us a global understanding of your dental health, this kind of image also enables us to precisely plan more complicated procedures such as a wisdom tooth extraction or dental implant placement. We’ll be able to find the perfect place in your jaw to operate without interfering with any of the sensitive nerves. In the end, this will lead to both a successful procedure as well as a quick and virtually painless recovery. Back in 1994, lasers were first introduced to dentistry, and now, they are one of the most useful tools we utilize every day. With dental lasers, we’re able to perform a wide array of treatments much faster and less invasively. With our Pioneer Pro soft tissue laser, for example, we can perform even the most sensitive periodontal procedure while keeping a patient completely comfortable. Its highly-concentrated beam of light is able to instantly vaporize harmful bacteria located along the gum line, and it can even painlessly remove infected tissue. Better yet, it can do both of these tasks while leaving the surrounding healthy tissue completely untouched. Typically, procedures of this kind would involve a scalpel and sutures, but now, we don’t need either thanks to the laser. It sterilizes the area as it goes to reduce any swelling or the chance of infection, and it even cauterizes blood vessels to prevent bleeding. One of the most important things we do in dentistry is trying to catch tooth decay as quickly as possible. When discovered in its earliest stages, tooth decay can often be reversed using conservative treatments to prevent a cavity from ever forming. In the past, trying to find decay only consisted of a dentist using their eyes and a small metal probe, and this left many hard to see areas of decay undetected until it was too late. But now, thanks to our Sopro Life Cavity detection system, it’s easier than ever to keep your smile healthy and whole. This system uses a focused beam of light to scan the enamel, and this creates a sound and a readout your dentist can observe to determine the state of your teeth. It is able to detect even the slightest hint of decay, much smaller than a traditional exam would be able to find. With this information, we’ll be able to intercept decay more quickly to help preserve more of your natural teeth over time. In the past, if you needed a damaged tooth repaired with a dental crown, it would require at least two visits to the office, a messy dental impression, and a week spent with an unreliable temporary crown in your mouth. Thanks to CEREC® 1-Visit crowns, now you don’t have to deal with any of that. 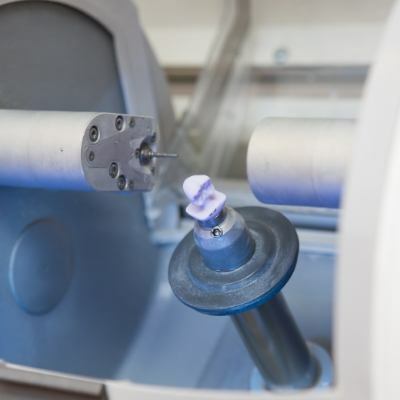 This system allows us to design, fabricate, and place a completely custom-made dental crown in just a matter of hours, not weeks. With this, you’ll simply walk into our office, and then you’ll walk out with a completely restored smile. It’s just that simple.